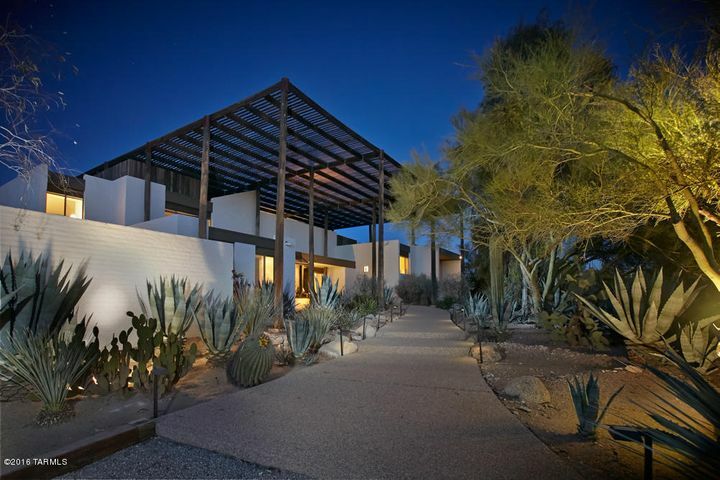 Your welcome to the energy efficient Ramada House begins as you drive up the winding saguaro studded driveway to reach this extraordinary home. Designed by AIA winning architect, Judith Chafee in '75 & listed on the National Register of Historic Places in '06, the home is shaded by a huge ramada allowing for cool temps.& soft light to enhance the interior year round. Features include custom detailing throughout, pristine condition, high ceilings, stunning mt. & city views from all rooms, granite & stainless kit.,extensive built-ins inc. 10' library bookshelves,4 desks, buffet & 15 closets. Uniquely planned for both private life & and entertaining. Property tax reflects Historic designation. 4 additional acres available. Seller is licensed realtor in Arizona. Directions - From Campbell & River East to Camino Real. North 1.5 mi, to Camino Norberto. West to 2801.